For travelers looking for Katowice airport parking, ParkVia offers a wide range of car parks located close to the airport terminal. The car parks we list offer a secure solution to parking your car at Katowice airport. We offer car parks which are open 24 hours a day and with free transfers or meet and greet service. Car parks are illuminated, secure and insured, with friendly service at very competitive prices. If you would like to find out more about each of the car parks listed on our website for Katowice airport parking please click on their logos. How to book Katowice airport parking? To obtain a free quote just enter the dates and times you wish to leave your vehicle and then click on 'Check Availability'. If you are happy with the quote, just click on 'Book' to proceed with your online booking and fill in the details requested on the booking form. The airport is located in Pyrzowice, about 30km north of Katowice city centre. It is the third busiest airport in Poland and is constantly developing. Future plans include extending the runway, the construction of a third passenger terminal, a new and bigger CARGO TERMINAL and a new runway. The main airlines operating from this airport include Ryanair, Wizz Air, Lufthansa, LOT, OTL, SAS. Katowice-Pyrzowice International Airport is southern Poland's main airport. Its prime location that is in close proximity to the large and popular cities such as Krakow and Wroclaw, has resulted in a recent increase in tourist traffic in and out of Katowice. 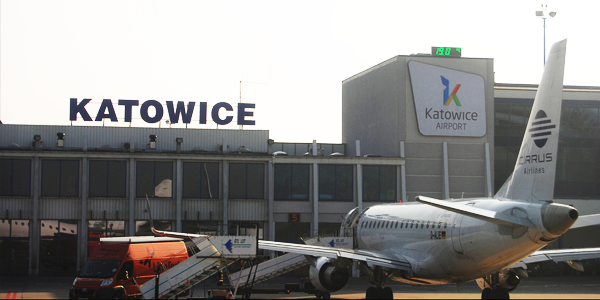 Consequently, there has been a significant increase in the number of airline companies offering cheap domestic and international flights operating at Katowice-Pyrzowice International Airport.